HeavenGifts.com sent me the 4ml version of the Estoc tank, dubbed the Estoc Mega, for the purpose of review. Watch the video or read the review below. I’m guessing that Vaporesso named this tank after the estoc sword, which is a type of long sword that doesn’t have sharp edges, but has pointed tip. It was designed for thrusting and was invented in the 14th century. There’s your history lesson for the day! There are two sizes of the Estoc tank available; 4ml and 2ml and they come in either black or silver colors. Replacement coils come in packs of 10. The 0.4 ohm and 0.5 ohm traditional clapton coil pack costs $16 and the 0.5 ohm ceramic coil pack costs $18. In the box you get the tank, an extra replaceable coil, a replacement glass tube, and two protective covers – one red and one gray. Vaporesso claims that it’s a leak proof system, and based on my experience with it, I agree. I’ve been carrying this tank around and I haven’t had any leaks at all. I’ve even stored it sideways in my backpack throughout the day and overnight without any leaking whatsoever. It has a delrin drip tip, which is pretty standard. It’s not a wide bore, but it’s large enough to get an airy draw. It comes with what they are calling “protective covers,” which I believe are designed to protect your lips from getting burned if the tank gets hot. I haven’t found a need to use them. The tank doesn’t seem get hot enough to need the covers and I don’t put the atomizer that close to my lips anyway. The covers are nice for changing the colors of the tank though, for example if you have a red device that you want to match the tank to. This tank uses Vaporesso’s all new EUC coil, which stands for Eco Universal Coil. This new coil system is designed to make replacing coils easy. All you do is drop the coil core into the atomizer and put the tank back together. The core is very small and uses much less metal than most other replaceable coil heads on the market. This is supposed to save money and reduce waste, hence the Eco part of the name. Vaporesso says that their coils deliver cloud-sized vapor with the purest flavor. I’d say that’s a fairly accurate description. You aren’t going to blow massive clouds with this tank, but you’ll get a nice amount of vapor. And the flavor I’ve been getting has been excellent. I get the best flavor with the ceramic coil, but the flavor from the cotton coil is really good too. The Estoc has an easy top fill system. You can leave it attached to your device and unscrew the top of the tank and fill it up. The glass doesn’t slip off the deck so there’s no worry of the juice pouring out. It has bottom airflow adjustment. The airflow can close down to a very tight draw and open enough to get a nice straight-to-lung draw. It’s a 22mm diameter tank and fits well on most 22mm mods. I’ve tried it on the iStick 50w, the iStick 100w TC, the Wotofo Chieftain 220 watt mod, the Smok XCube II, the little VPark 30w, and the Fuhattan tube mech mod. It looks great on all of them, except for the Fuhattan because the Fuhattan is 24mm in diameter. It’s a great looking tank. I really like the way it looks on everything I’ve used it with. The airflow isn’t great for mouth-to-lung vaping, because even with the airflow closed as tight as possible, it still has just a little too much airflow. I’m sure vapers who like restricted airflow would enjoy the tank though. If you’re looking for a lot of airflow, this tank has it. It’s not like a competition RDA or anything like that, but the airflow should satisfy most people. 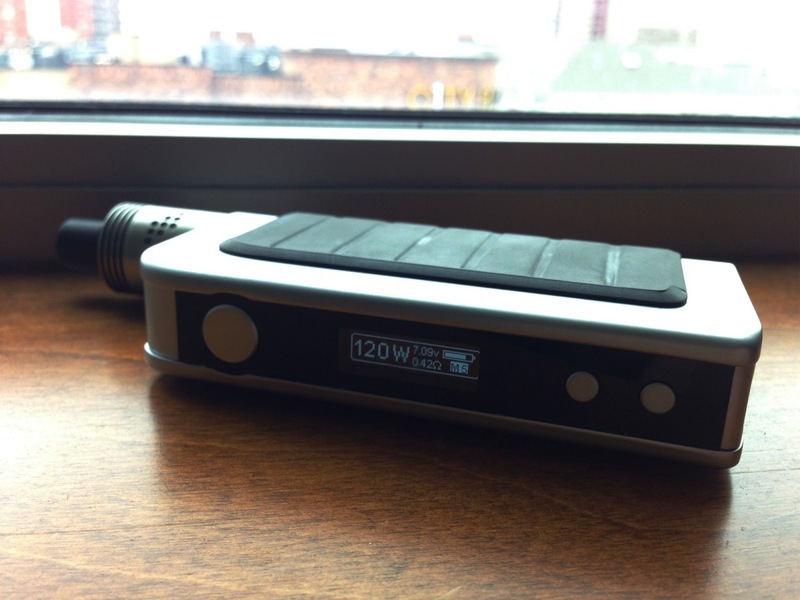 If you normally vape at really high wattages, say 80 watts or higher, you might need to raise your nicotine levels with the ceramic coils since they can’t be used higher than 35 watts. The 0.4 ohm cotton coil on the other hand, can go up to 50 watts, which provides a more satisfying experience for people who like hotter vapes, such as myself. I really like how simple this tank is. It’s easy to assemble and there’s nothing confusing about it. There aren’t a bunch of little parts that you need to worry about losing. I was really surprised by the flavor output of this tank. The flavor was strong until after I vaped about 16ml’s through it. It was still working fine at that point, but the flavor production has just slightly lower than when the coil was new. The cotton coil seems to be about the same. I’ve been looking for a tank that can handle fairly high wattage, that offers good flavor, that looks nice, and most importantly, a tank that doesn’t leak. This one so far meets all of those things and I really like it. You can get this tank from HeavenGifts.com in either the Black Model or Silver Model (affiliate links). Coil Master sent me the Coil Master DIY Kit V2 for the purpose of review. Before I received this DIY kit, all of my coil building tools were thrown into a little drawer that I keep next to my desk. It’s kind of like the junk drawer that most people have in their kitchen. I try to keep it organized, but it continues to get messier as I take supplies in and out of it. I’ve been wanting to buy an electronic hookah head for several months now, ever since learning that they exist. They’re so expensive though and I just wasn’t sure how well they would work. Not to mention that even if I did buy one, I would only be using my hookah on the rare occasions when I have friends over. For those reasons, I couldn’t justify paying $100 or more.